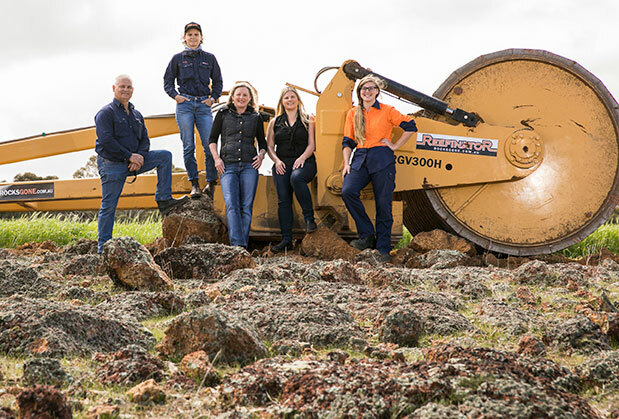 The Rocks Gone Reefinator has been awarded the Growth Category winner at the WA Innovator of the Year awards 2017. Rocks Gone founder and inventor, Tim Pannell was thrilled to receive the award. Many of the soils farmed in Australia can be classed as just a thin layer of dirt that in many cases covers a rock base. This poses a myriad of problems for farmers who already have cleared land as the rocky land is often regarded as unproductive or too costly to turn into productive soil. “What farmers need to understand, is that finally there is a solution to the age old problem of farming productively on rocky land”, says Tim Pannell, Managing Director of Rocks Gone. Mr Pannell, a third-generation farmer from Chapman Valley WA, knows all to well the problems that rocky land poses for farmers. 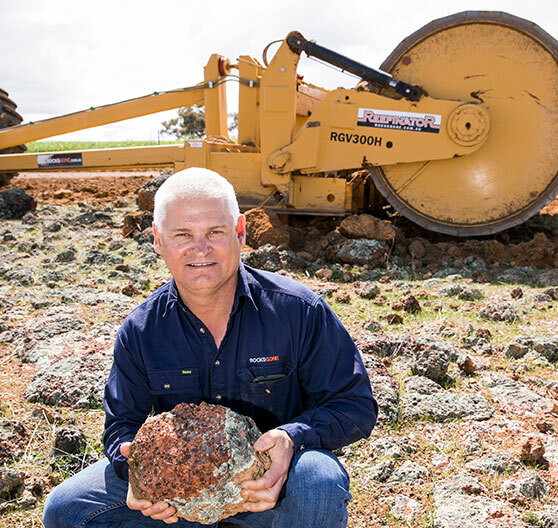 Pannell established a contracting business using a rotary rock crusher to crush the rock on farming land. “It proved to an expensive business”, said Pannell, “With too many moving parts and high wear rates, I thought there had to be a more cost effective option”. After testing five different prototypes, Pannell found success with The Reefinator, a multi pass machine that crushes rock far more efficiently and quicker than any other machine on the market. The Reefinator is a towed implement and has a grate, much like a cheese grater, that holds down the rock and rips up manageable lumps that can be crushed by the following roller. After several passes, the biggest lumps of rock you’ll find are the size of a fist. The innovation has proven to be cost effective, as it rips up and crushes rock, improving soil quality and depth, and thus its yield potential and water retaining capacity. Farmers who once struggled with stony soil can now improve their productivity. The Reefinator is designed to be simple, durable, and cost effective. The designated wear parts and weak points are quick and easy to replace, while the rest of the implement is tough and ready to last thousands of hours of work. “Farmers now have the very real option of increasing soil depth which has a range of agronomic benefits including greater water and nutrient holding capacity, greater rooting depth which also then helps with crop and pasture resilience in times of crop stress”, says Pannell. “This is such an exciting time to be involved in farming in Western Australia. Finally land can be productive and farmers can get back to being the main producers in Australia”. Pannell estimates some $210 million to be added to the West Australian farming economy, if 350,000ha of shallow land is converted into productive land. West Australian farmers who have lateritic soils, are singing the praises of The Reefinator right across the Wheatbelt and also in South Australia, as they watch their once unproductive land be turned into high yielding crops which are not only retuning healthy profits but are also dramatically increasing the value of land and farms.